Last week, Philippine Defense Secretary Delfin Lorenzana confirmed reports that Japan had been talking to the Philippines about selling it radar technology to boost Manila’s surveillance capabilities. While the idea of such a deal is not new, it has once again highlighted a transaction that would constitute a significant development not just for bilateral relationship but the wider region as well. The idea of Japan selling defense equipment to the Philippines is not new. Indeed, this aspect of the defense relationship has been advancing in recent years even amid the initial uncertainties posed by Philippine President Rodrigo Duterte, as evidenced by developments such as Tokyo’s donation of TC-90 trainer aircraft for the Philippine Navy (PN), the provision of vessels for the Philippine Coast Guard (PCG), and the granting of parts for helicopters for the Philippine Air Force (PAF) (See: “Why Japan’s New Military Aircraft Gift to the Philippines Matters”). There have also been quieter, ongoing conversations between Tokyo and Manila on other defense equipment deals as well, including on boosting surveillance capabilities and the strengthening of defense infrastructure. Over the past few weeks, another round of reports has surfaced regarding Japan selling radar technology to the Philippines – specifically the Mitsubishi Electric FPS-3 air defense radar system. The notion of a potential sale gained traction when Defense Secretary Delfin Lorenzana confirmed on December 13 that Japan had offered the Philippines “their latest radars,” and that this was one of the platforms being evaluated by the PAF. Should it occur, the sale of radar equipment would no doubt be a significant development. For one, it would represent an unprecedented move in terms of how Japan’s easing of its arms export ban is gradually translating into actual sales to partner countries. More generally, it would constitute an acceleration of Tokyo’s already deepening involvement in helping Manila strengthen its still limited surveillance capabilities which are critical for addressing security issues ranging from transnational crimes to the South China Sea. This would come following other efforts as well, including talk about Tokyo’s assistance with the funding of the construction of radar stations in the Philippines. That said, as of now, few details have been publicly issued by either side, and specifics remain unclear on the exact costs of the system and the other countries that could fulfill Philippine needs. These particulars are important because, as we have seen on previous potential deals such as Tokyo’s bid to build submarines for Australia, strategic considerations should be weighed against other factors that can play into which of a range of players ultimately secure wins, whether it be price or domestic politics. Earlier this month, Nikkei Asian Review cited an anonymous source connected to the Japanese government as saying that Japan’s price for the system, which Japan’s Air Self-Defense Force has used since the 1990s, would be between 1 and 2 billion yen, that Manila had also approved the United States and Israel on the acquisition, and that a decision could be made as early as the start of 2019. How exactly all of this plays out remains to be seen. 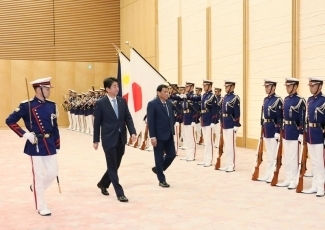 But given the momentum we have seen in Japan-Philippines defense ties in recent years as well as the rising significance of the relationship amid wider domestic and regional trends, the deal will continue to be one among several that will be important to watch into next year.